In honor of Halloween, we had some friends over last night and we watched Young Frankenstein followed by A Nightmare on Elm Street. 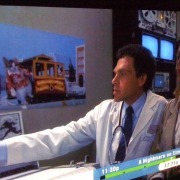 Halfway through Nightmare, we noticed an amazing poster on the wall behind the doctor at the sleep institute. Yes, that’s a giant cat riding a cable car in San Francisco. 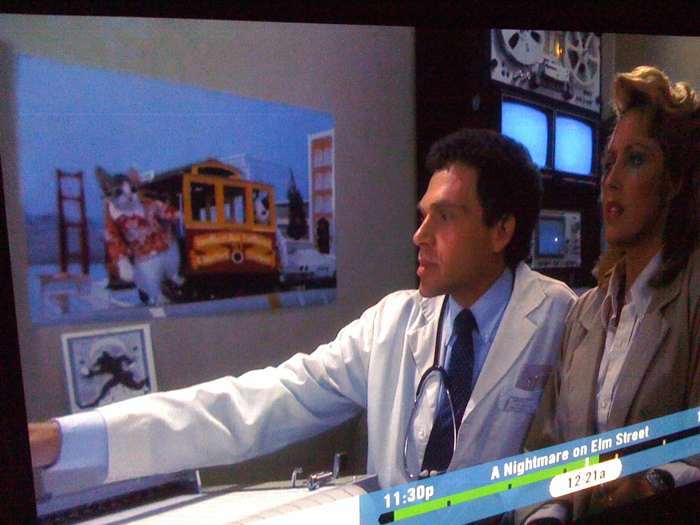 There was also a dogs playing poker tapestry in the basement where Mr. Krueger met his original end, but we didn’t get a picture of that one. Nice work, set dressers! Editing Snapz Pro Source Files in FCP Is Vuze No Longer Generating Revenue For Me?